This is a list of the 95 counties in the State of Tennessee. A county is a local level of government smaller than a state and typically larger than a city or town, in a U.S. state or territory. As of 2010, Shelby County was both Tennessee's most populous county, with 927,644 residents, and the largest county in area, covering an area of 755 sq mi (1,955 km2). The least populous county was Pickett County (4,945) and the smallest in area was Trousdale County, covering 114 sq mi (295 km2). As of the same year, Davidson County, in which the capital Nashville is located, covers 502 sq mi (1,300 km2) with a population of 569,891. 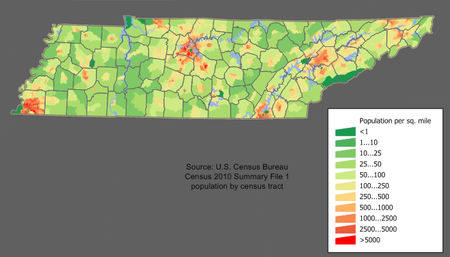 The population of the state of Tennessee as of the 2000 census was 5,689,283 in an area of 42,169 sq mi (109,217 km2). The oldest county is Washington County, founded in 1777. The most recently formed county is Chester County (1879). According to the 2000 census, the center of population for Tennessee was located at 35°47′45″N 86°23′52″W﻿ / ﻿35.795862°N 86.397772°W﻿ / 35.795862; -86.397772, 2.5 mi (4.0 km) south of Murfreesboro in Rutherford County. The center of population pinpoints the location at which the population of the state, as placed on a map of the state where they reside, would balance out the map. The geographic center, the point where the map of Tennessee would balance without the population, is located 5 mi (8 km) northeast of Murfreesboro. In 1976, the Rutherford County Historical Society marked the geographic center of Tennessee with an obelisk. Some of the counties were formed in part or completely from lands previously controlled by American Indians. The "Indian lands" were territories that American Indians had occupied from pre-Columbian times and to which they were granted the legal right of occupancy in an act of the United States government. In cases where counties had been formed from that territory, the legal right of American Indian occupancy was revoked in a federal act prior to the formal establishment of the county. For Tennessee, ten treaties were negotiated between 1770 and 1835, defining the areas assigned to European settlers and to American Indians, regulating the right of occupancy regarding the lands. The remaining indigenous population was eventually removed from Tennessee to what became the state of Oklahoma. The Federal Information Processing Standard (FIPS) code, which is used by the United States government to uniquely identify counties, is provided with each entry. FIPS codes are five-digit numbers; for Tennessee the codes start with 47 and are completed with the three-digit county code. The FIPS code for each county in the table links to census data for that county. James County, Tennessee (1870–1919): Now part of Hamilton County. The county seat was Ooltewah. Tennessee County, Tennessee (1788–1796): When Tennessee achieved statehood, the previous Tennessee County in North Carolina became Tennessee County, Tennessee, and was divided into Montgomery and Robertson Counties. Three Tennessee counties operate under consolidated city–county governments, a city and county that have been merged into one jurisdiction. As such, these governments are simultaneously a city, which is a municipal corporation, and a county, which is an administrative division of a state. ^ a b c d e National Association of Counties. "NACo – Find a county". Archived from the original on 2005-04-10. Retrieved 2007-07-22. ^ "Population centers of each U.S. state, 2000". census.gov. United States Census Bureau. Archived from the original on 2001-12-12. Retrieved 2008-01-01. ^ "Geographic Center of Tennessee". rutherfordchamber.org. Rutherford County - Chamber of Commerce. Archived from the original on 2007-12-13. Retrieved 2008-01-01. ^ "Indian Lands". FindLaw.com. Archived from the original on 2007-12-30. Retrieved 2008-01-20. ^ "Treaties". Tennessee Encyclopedia of History and Culture. University of Tennessee Press. Archived from the original on 2011-08-30. Retrieved 2008-01-20. ^ a b "EPA County FIPS Code Listing". EPA. Archived from the original on 2004-09-28. Retrieved 2007-04-09. ^ Keen, Judy. "2010 Census Shows Population and Diversity Trends". USA Today. Archived from the original on 2011-03-09. Retrieved 2011-03-17. ^ "Archived copy". Archived from the original on 2014-02-22. Retrieved 2014-02-06. CS1 maint: Archived copy as title (link) "Landon Carter"
This page was last edited on 12 April 2019, at 10:20 (UTC).